Nathan Pohio, Raise the anchor, unfurl the sails, set course to the centre of an ever setting sun!, 2015. Commissioned by SCAPE Public Art. Image courtesy of the artist and Jonathan Smart Gallery, Christchurch. Photo by Hannah Watkinson. Nathan Pohio lives and works in Ōtautahi. His moving-image works draw on a variety of photographic and cinematic practices. Since first exhibiting in the late 1990s, Pohio has continuously worked to represent the indigenous voice within the field of Expanded Cinema, a field first defined in 1970 by Gene Youngblood in a book by the same name. Youngblood argues that a new, expanded cinema is required for a new consciousness. Pohio perceives indigenous voices present within this notion as he notes that distinctive developments within the language of cinema occur over time and internationally. In his work, Raise the anchor, unfurl the sails, set course to the centre of an ever setting sun!, Pohio has cropped an image sourced from a 1905 edition of the Canterbury times, which depicts Māori leaders on horseback in full ceremonial dress, korowai and kākahu (cloaks), flanking Lord and Lady Plunket in their motorcar on a visit to Kaiapoi. The tight crop around the subjects is reminiscent of heroic line-ups of characters from early popular cinema, particularly the poster for Magnificent Seven (1960) directed by John Sturges, a remake of Akira Kurosawa’s 1954 film, Seven Samurai. This iconic film inspired generations of film-makers, and although Pohio’s image predates the famous western poster by some 50 years, his re-presentation of it uses similar cinematic language. Illuminated at a grand scale and a proportion approximating Panavision for SCAPE 8 New Intimacies, the 110-year-old image reads like a billboard for the latest blockbuster. Sited in the Park of Remembrance, it offers acknowledgement of the histories of Ōtautahi - Christchurch and the meetings of cultures alongside the Ōtākaro - Avon River. It offers the viewer a chance to imagine the narratives of these characters and what these stories mean for a city currently reimagining itself. Nathan Pohio; photo courtesy of the artist. Nathan Pohio is an artist working in video and other photo media. Exhibited widely his practice is concerned with the contemporary Māori society, cinema and pre-cinema histories delivered by way of a minimal cinematic installation. Since first exhibiting in the late 1990's, Pohio has continuously worked to represent the indigenous voice within the field of Expanded Cinema; first defined by Gene Youngblood in 1970 (the year Pohio was born). Youngblood argues that a new, expanded cinema is required for a new consciousness. Pohio perceives indigenous voices present within this notion as he notes distinctive developments within the language of cinema occur over time and internationally, so he sees meaning in an international cinematic language at work. Pohio is known for rigorous research providing after thoughts and after images. Employed at Christchurch Art Gallery Te Puna o Waiwhetū and a long term board member of The Physics Room, a contemporary project space in Christchurch. Pohio is also a founding member of Paemanu, a charitable trust established for the advocacy of Ngai Tahu Contemporary Visual Arts. Pohio was invited to participate alongside fellow Aotearoa artists Ralph Hotere and Mata Aho Collective in Documenta14, considered to be the most prestigious art exhibition in the world. 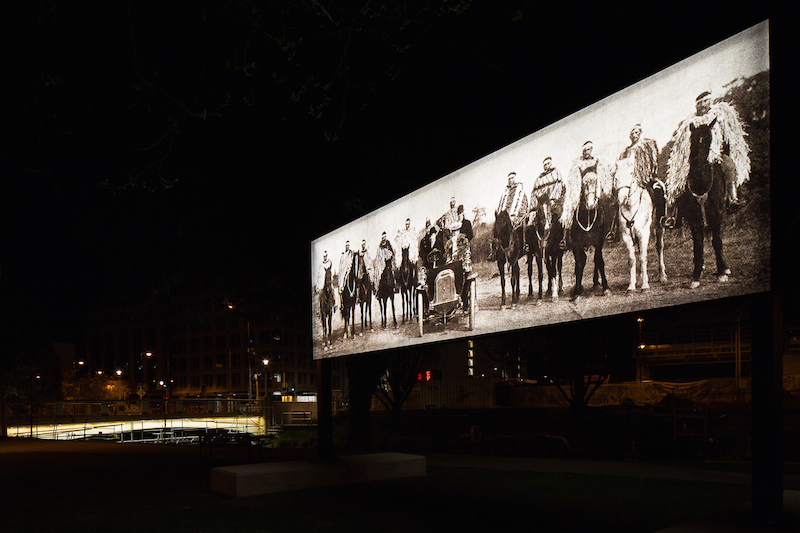 Pohio exhibited at Athens Greece and Kassel Germany, the first Aotearoaian New Zealander to exhibit at a Documenta. Pohio works to see cinema expanded in all directions, he is totally committed to and supportive of artists working in moving image and is extremely excited by indigenous voices operating within that.